Now this description intrigued me no end, so I had to check it out. 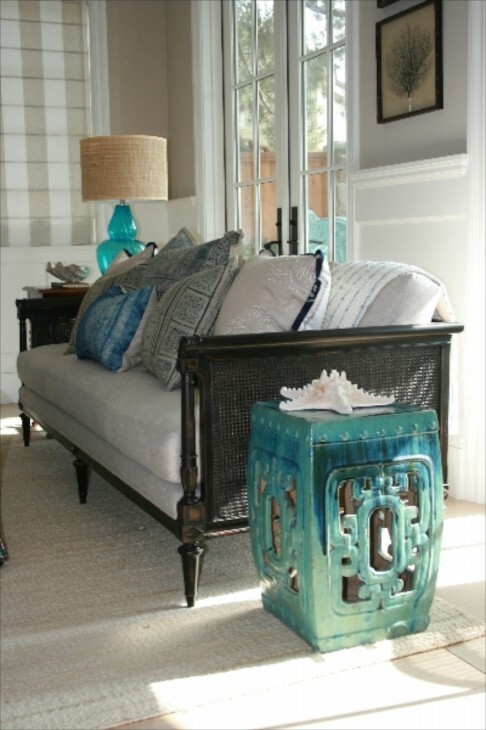 Fully described as “eastern seaboard style home with elegant California beach vibe”, and I think after studying the photos, I would have to agree. 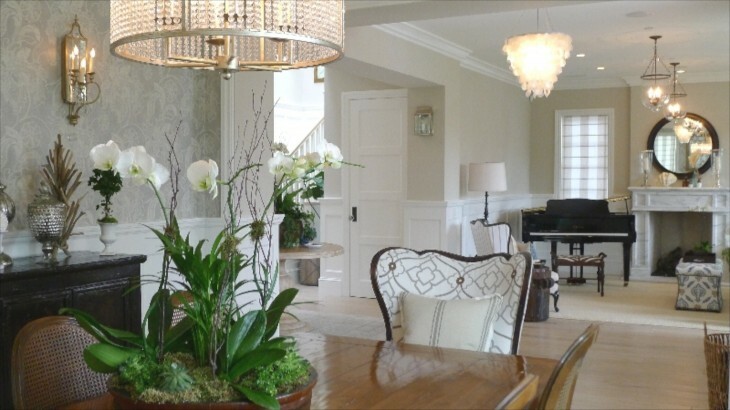 This home was part of a five home House and Garden tour presented by the Newport Harbor Educational Foundation in Newport Beach, California. 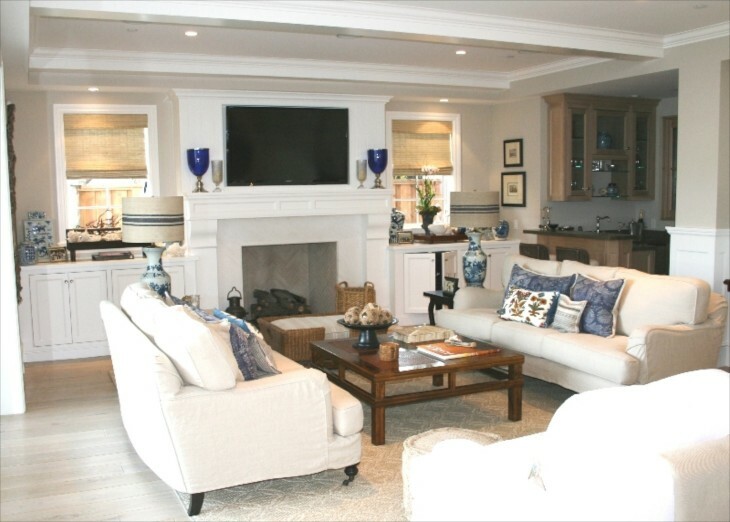 Their proceeds from the Home Tours has raised a lot of money, to the tune of $500,000 over 5 years, that directly benefits student programs at Newport Beach High School. Enjoy the photos below and see if you agree that interior designer Stacia Dunnam, collaborating with Elizabeth Elliott Design accomplished a quite successful merger of two different style expectations. The architect was Brandon Architects, Inc. and the builder Patterson Construction Corp. All the homeowners were certainly gracious with their participation in this event. To thank them, the Foundation invites talented art students to draw or paint a rendering of the homes on the tour, and the drawing is then given to the homeowner in appreciation. Nice touch. 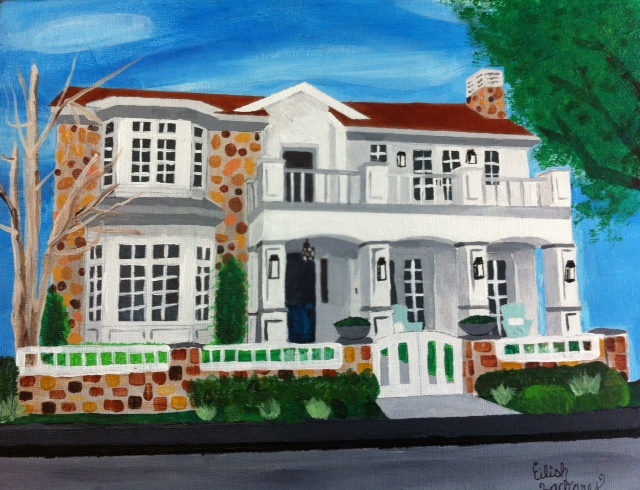 The photo below is her rendering of the house shown in all the photos below, and was created by Eilish Zachary, 18 and a senior at the Newport High School. I think she did a very nice job! I really like this kitchen. Serene and inviting, yet casual in feel. Plenty of space for a crowd. The touches of celedon green in the Roman window shades and in the upper cabinets ties in with the color of the wall in the eating area. 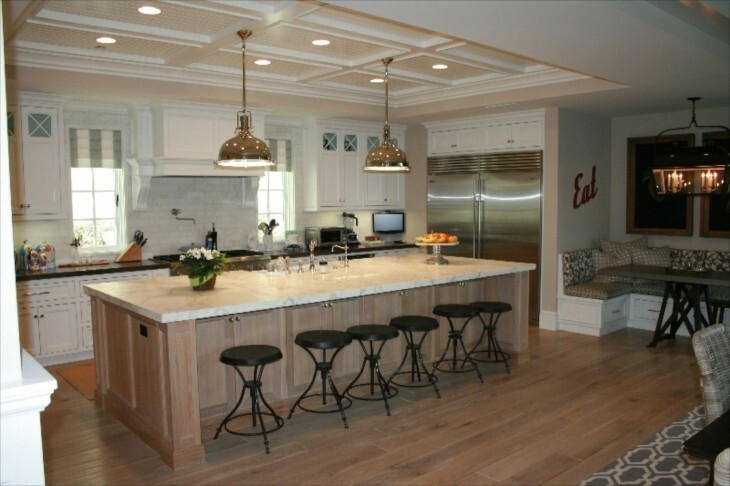 Coffered ceiling is a nice touch. 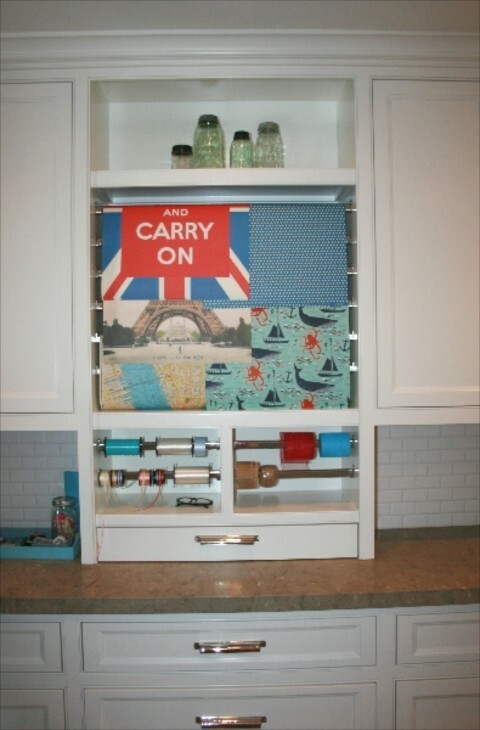 I do think that refrigerator freezer could hold all the groceries needed for that visiting crowd as well. Really nice how the use of gray and sand tones helps to create that beach feel, yet in an understated way. Just the right punch of black in the art, and light fixture overhead. Nice wet bar over in the corner. 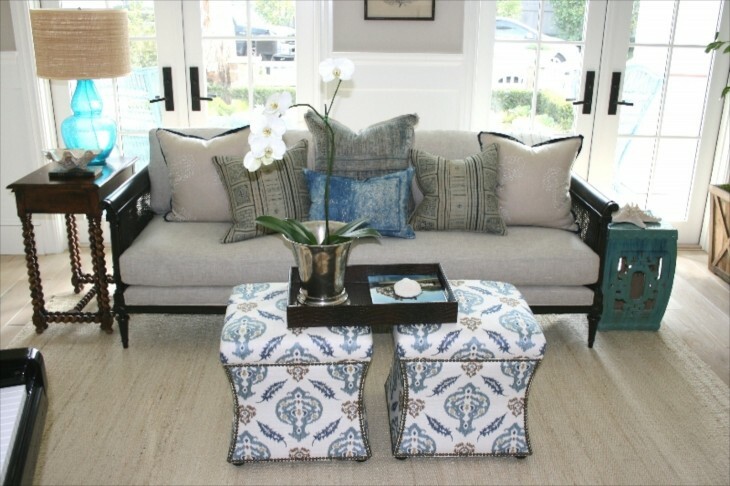 The pops of blue in the pillows and accessories is just enough. 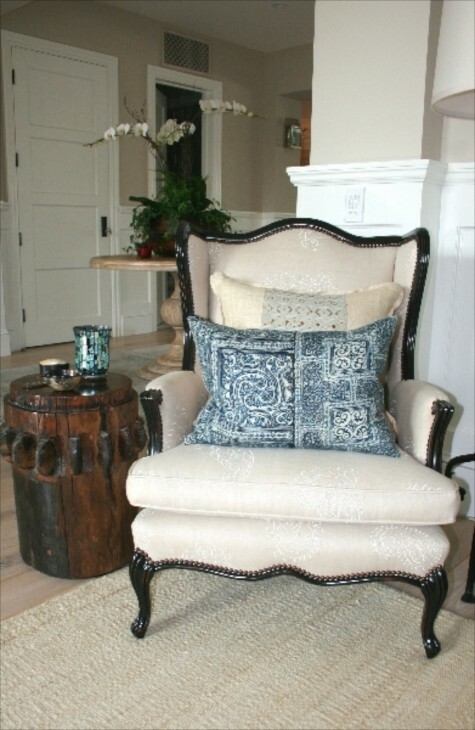 The pairing of a burlap shade, quite informal, with a very formal lamp base is unusual, but it works! 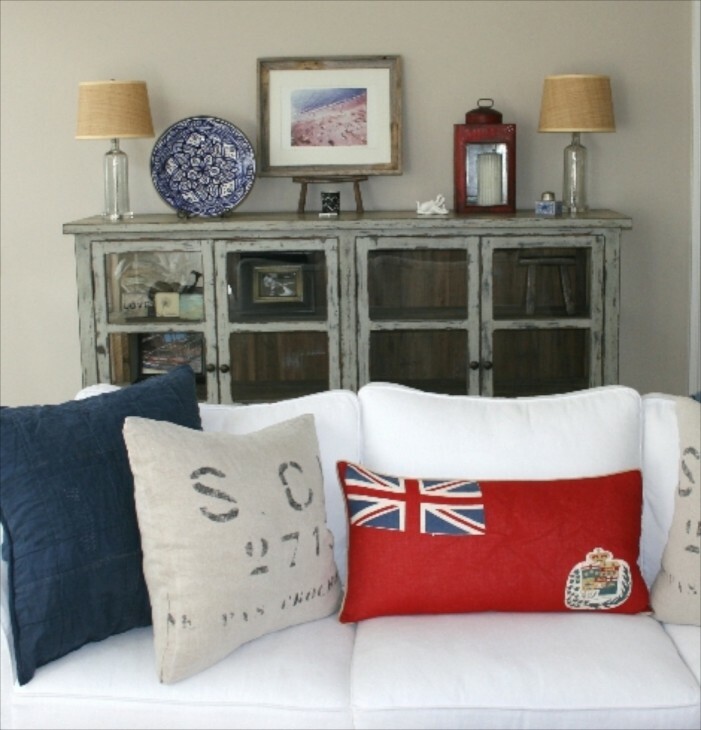 What would a home in a beach community be without some red white and blue? 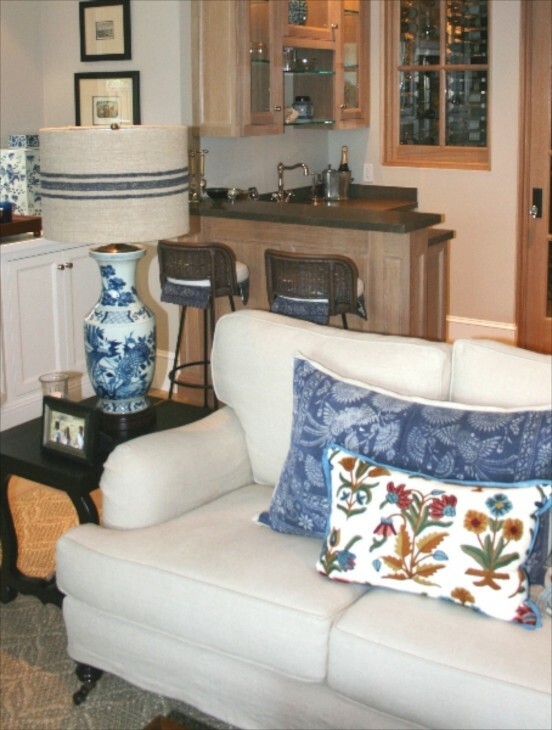 Here we see a continuation of the more textured lampshades, but in a more formal room. The blues here are varied, with a mix of patterns. Still serene. Another view that includes the stripped Roman window shades. 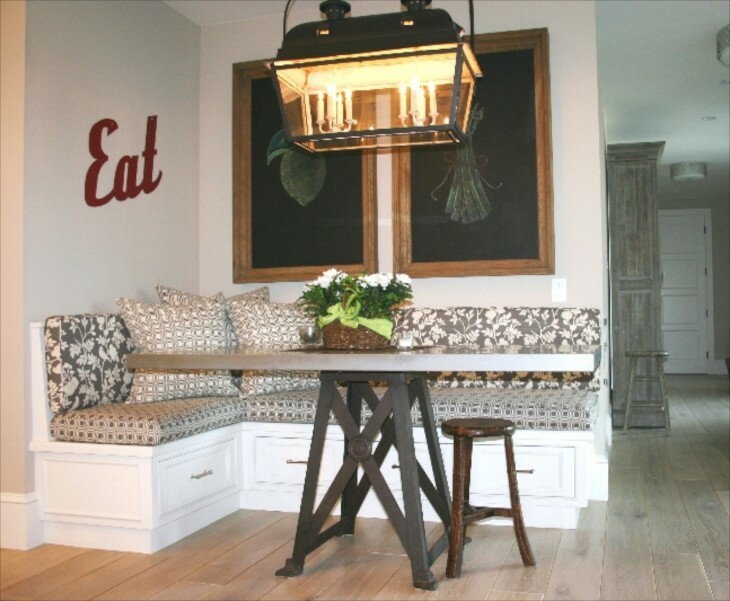 The furniture style throughout the house is eclectic and looks as though each piece was carefully selected because they loved it, and it all works well together. I am not a huge fan of wallpaper, but I quite like the choice for the dining room. The windows flood the room with light. 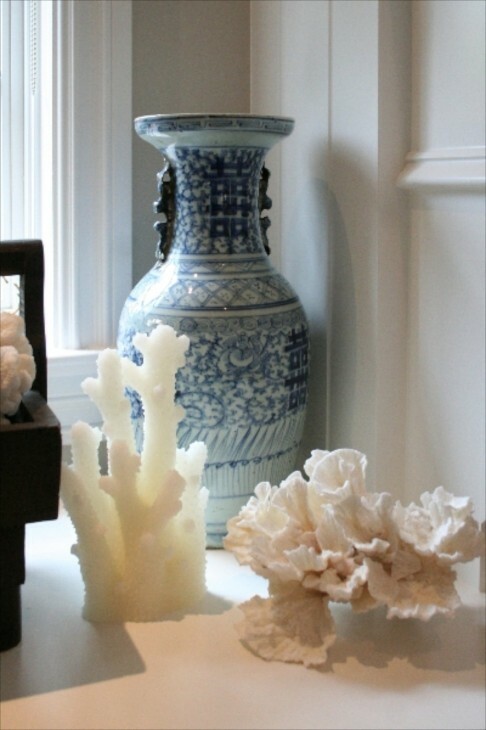 You know how love blue and white porcelain, here teamed with mercury glass. I love how there is a bit of black in most all the rooms. The dining room table is all set, ready for a party. 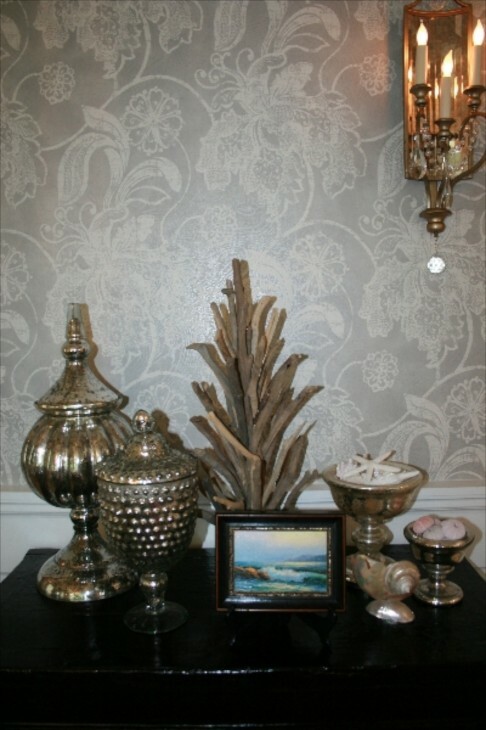 I really love a bit of bling, whether in formal or informal rooms, and here between the sconces and chandeliers, it is multiplied by the mirror over them mantel. I am sure it is stunning at night. 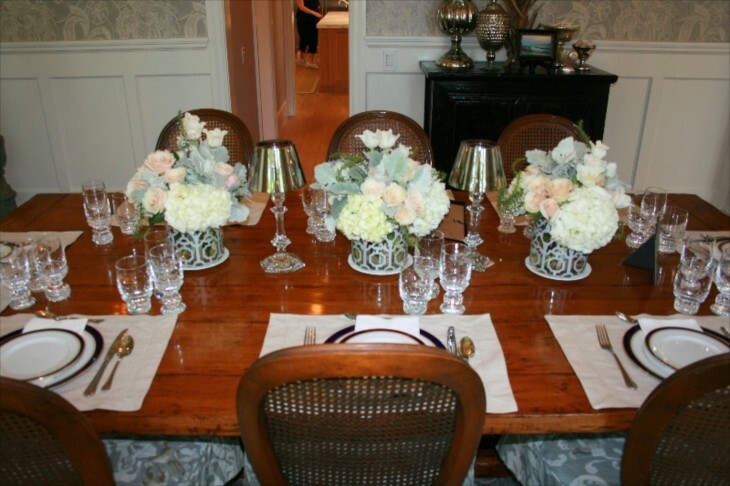 Really love the fabric choice on the two end dining room chairs, and the curves of the chairs as well. They look very comfortable. 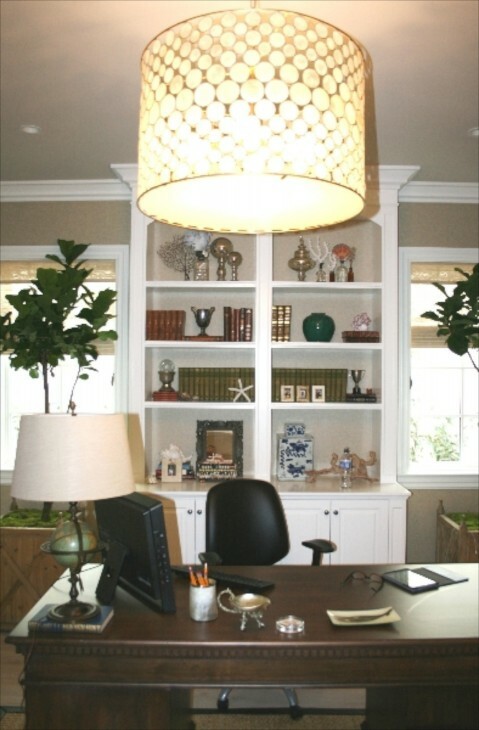 Who wouldn’t want to work or study in this office space? I just love how they took an eclectic collection of mirrors, frames and a set of antlers and put it together in such an interesting and creative way. One would have to be especially careful on the stairs not to take a tumble craning the neck to take it all in! 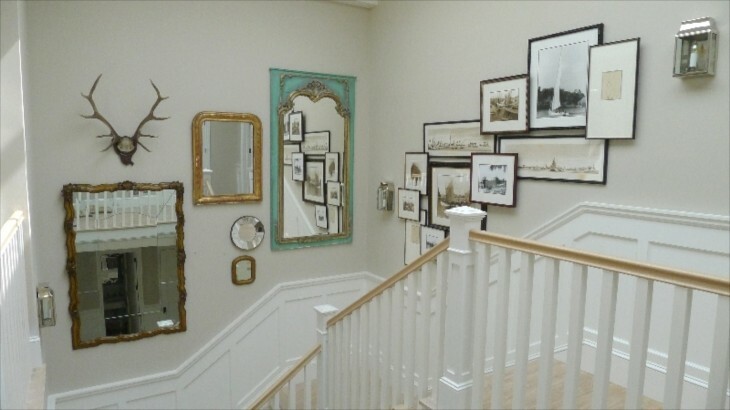 It really works well with the architectural details of the trim on the stair walls. Notice the two traditional sconces on the wall. Again, I bet it creates lovely and interesting shadow lines at night. I never tire of grasscloth, and here it lends texture to the smooth fabric of the bed headboard. 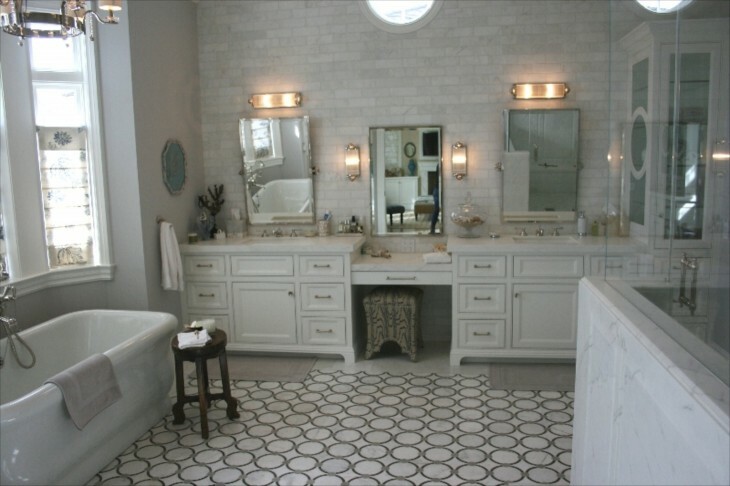 This master bathroom is dy-nooo-mite. No bumping into each other ever in here! 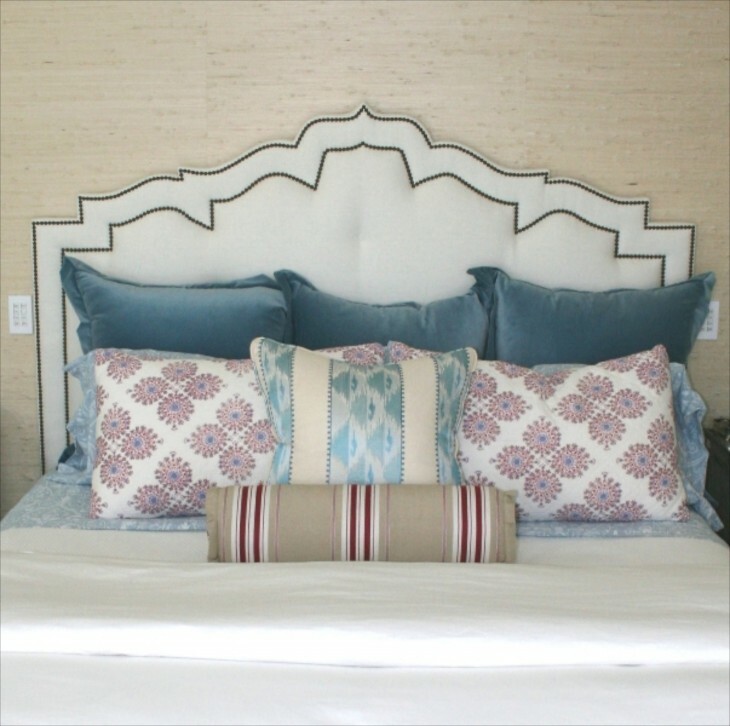 Despite the size, the mix of materials, soft colors and texture, subtle pattern, it works to make a welcoming space for getting ready for work or play. 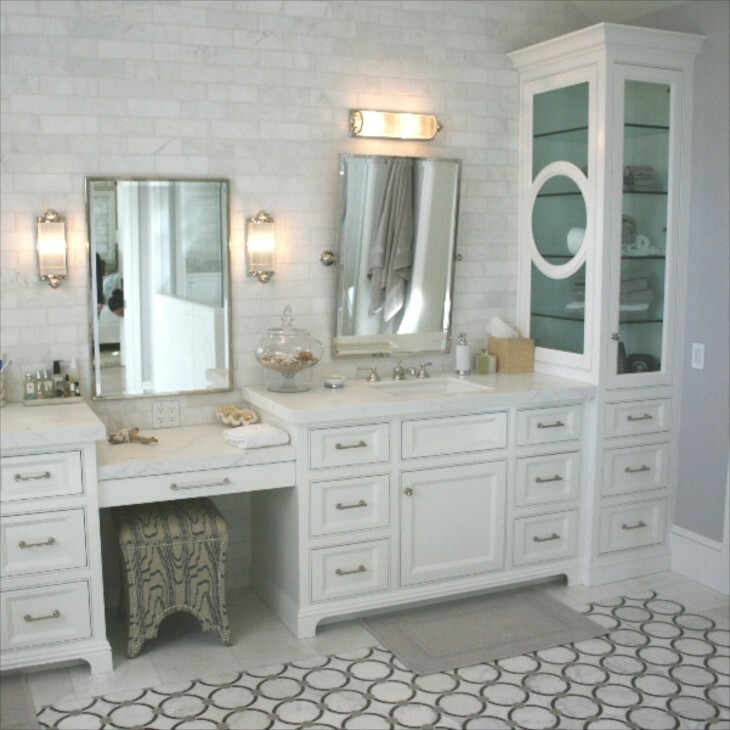 Nice touches like the tilting mirrors, the circular detail on the cabinet, lends interest and style. What can I say? Terrific space. 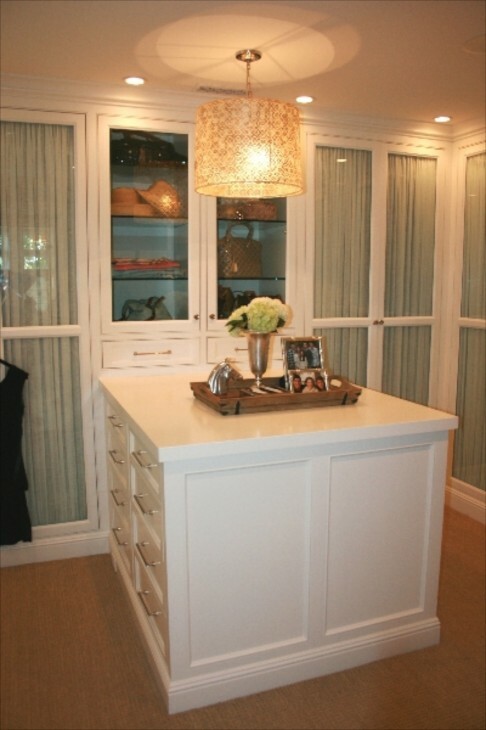 Adding a pretty light fixture in any closet keeps it from seeming too utilitarian. I also have sisal in my dressing room and love it. A very interesting table made from a wood stump……formal and casual mixing well. 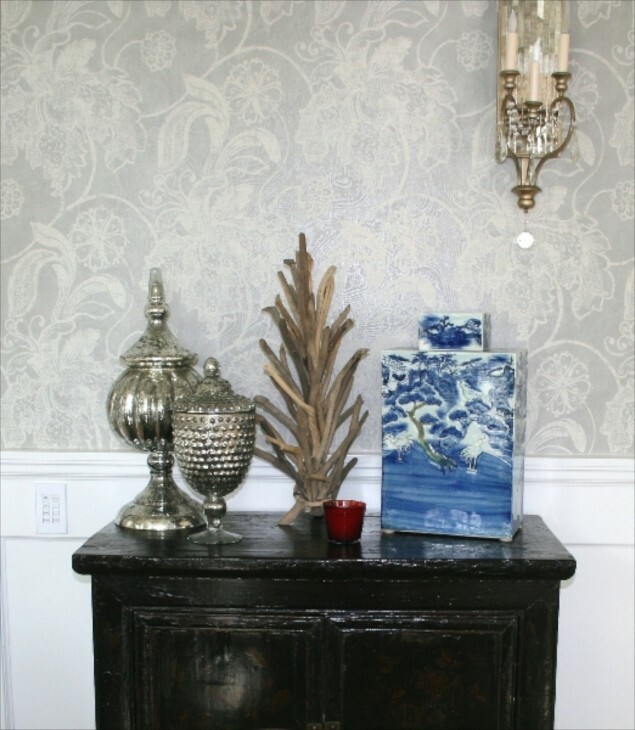 A closeup of that gorgeous wallpaper in the dining room and another vignette that includes beach shells and a miniature beach painting. 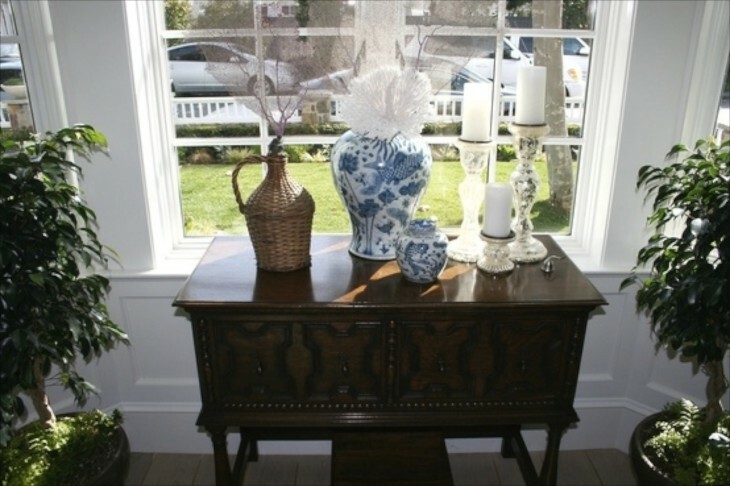 The wood adds a rustic element to an otherwise formal arrangement, repeated throughout the house. Love that blue and white! 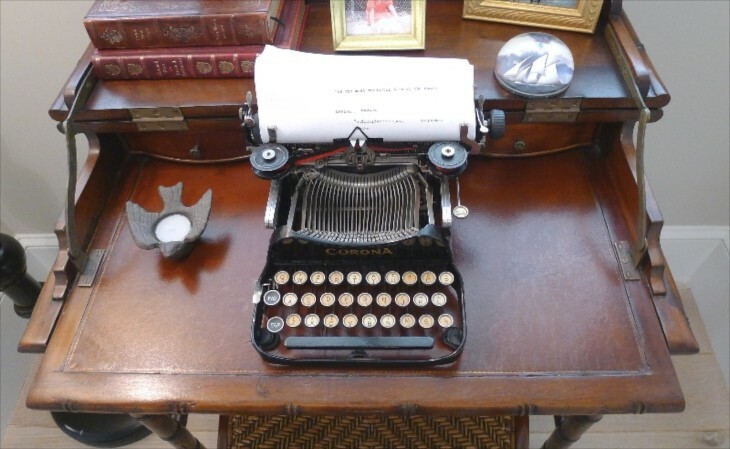 Lovely arrangement of an antique typewriter on an antique desk. 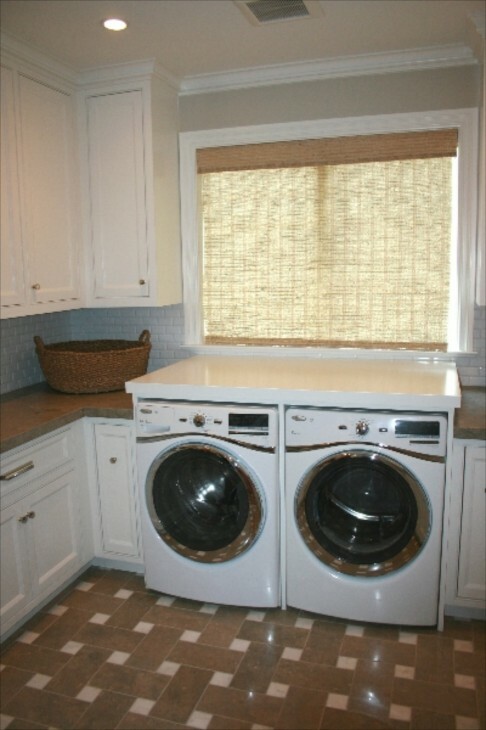 Wouldn’t mind doing laundry in here. It even has a gift wrapping area. 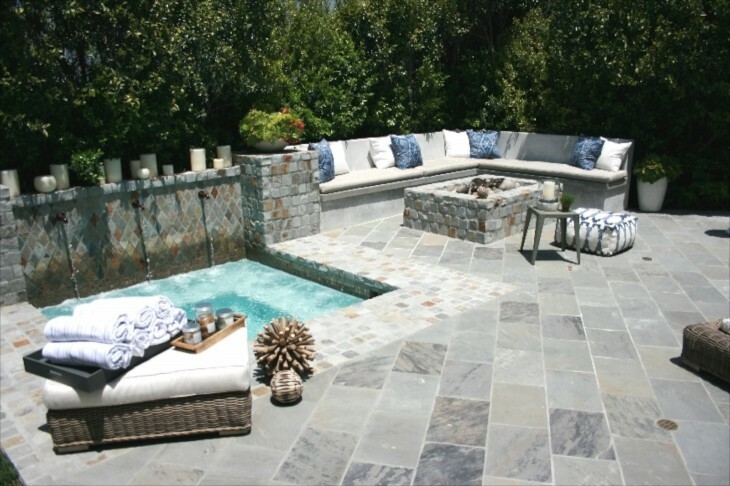 The stone on this patio carries the softs colors seen in the house to outdoors. Candles on the ledge, a spa water feature combination (notice the water spouts on the stone wall over the spa) and a fire pit. What’s not to enjoy? Thank you Laurie! Knowing my readers are enjoying the posts really does make my day as well. Beautiful! I love your comments, Charisse .